NFC has decided to ease off every thing for the customers who think its enough to use their wallets. 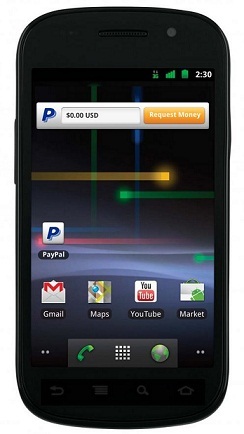 The technology has once again taken a major leap with PayPal's announcement of support for NFC on the Android phones. The announcement was made by PayPal Mobile senior director at MobileBeat 2011 Conference in San Francisco yesterday. The transfer via NFC is pretty easy. The users need to request for the payment initiation through PayPal NFC payments widget. Once the request is over, the phones are needed to be brought closer and let them vibrate. Enter your PayPal password or mobile PIN and the money is transferred. Everything is quite easy and fast. The transaction will cost no extra charges, they are free for PayPal customers . There is an issue with the payment system. Since Nexus S is the only Android phone to support NFC, the usage is quite limited to its users. This is not going to be there for a long time as market will surely see some more Android phones supporting NFC rolling in. The widget is going to be launched later this summer. So for the time being manufacturers will surely be eying on producing NFC supporting phones. Future phones will also support this new PayPal widget. Sometimes back Google also came up with Google Wallet which supports NFC technology. Google Wallet aims to work with traditional retailers and credit card companies and payment terminals. In case of PayPal, it has an edge of having large number of customers using the PayPal Mobile service. It will take sometimes before the service is widely visible.